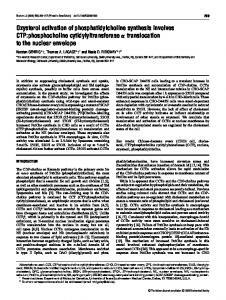 May 6, 2004 - The adenine nucleotide translocator mediates the mitochondrial membrane per- meabilization induced by lonidamine, arsenite and CD437. Sep 24, 2004 - Sean D. McKenna, Michael Pietropaolo, Enrico Gillio Tos, Ann Clark, ...... Merz K-H, Marko D, Regiert T, Reiss G, Frank W, Eisenbrand G 1998. Sep 2, 2014 - Edited by Kai Simons, Max Planck Institute of Molecular Cell Biology and ..... into our cell model, the human lung epithelial cell line H1299,. Mar 22, 1994 - of two methylxanthines, pentoxifylline and propentofylline, on arachidonic acid metabolism in platelets stimulated by thrombin. Biochen. Sep 13, 2010 - Background: Myocardial contractile failure in septic shock may develop ..... The main characteristics of septic cardiomyopathy are depressed. cytoid dendritic cells which can trigger immune complex ... Email: [email protected] ... nisms trigger lupus flares induced by transient exposure. Apr 11, 2012 - anti-mouse IgG, goat anti-rat IgG) and Elite avidinâbio- tinylated horseradish ...... Kiryu-Seo S, Ohno N, Kidd GJ, Komuro H, Trapp BD (2010). Apr 4, 2011 - Background: Hepatocyte Nuclear Factor 1a (HNF1a) is an atypical ...... Nuclear Factor 4 Alpha Is Associated with Mesenchymal-Epithelial. Measurement of Phagosomal pH (pHp)âFor these studies, zymosan particles were labeled with FITC alone or in combination with Oregon. Green, as indicated. Address correspondence to Elaine I. Tuomanen, Department of Infectious Diseases, St. Jude Children’s Research Hospital, 332 North Lauderdale Street, Memphis, TN 38105. Phone: (901) 495-3114; Fax: (901) 4953099; email: [email protected] J. Zweigner’s present address is Institute for Microbiology and Hygiene, Charité-Universitaetsmedizin Berlin, Schumannstrasse 20/21, D-10117 Berlin, Germany. death critically depends on leukocyte-derived products because damage to neurons can be attenuated by anti-CD18 antibody and recapitulated in vitro by inflamed, leukocytecontaining cerebrospinal fluid, but not cell-free fluid. In the second apoptotic process, the bacterium itself induces hippocampal neuronal death directly (7, 8). This process is not associated with the activation of caspases 1–10 and is not inhibited by z-VAD-fmk in vitro or in vivo. Rather, apoptosis is attributable to damage to mitochondria by two pneumococcal toxins, pneumolysin and H2O2, leading to the release of apoptosis-inducing factor (AIF) from mitochondria and large-scale DNA fragmentation. Injection of cells with anti-AIF antiserum or treatment with a calcium chelator blocks AIF release and neuronal cell death (7). In experimental pneumococcal meningitis, pneumolysin colocalizes with apoptotic neurons of the hippocampus, and infection with pneumococci unable to produce pneumolysin Abbreviations used in this paper: AIF, apoptosis-inducing factor; ALLN, N-acetyl-Leu-Leu-Nle-CHO; CCT, CTP:phosphocholine cytidylyltransferase; CDP-choline, cytidine diphosphocholine; CPT, choline phosphotransferase; LDH, lactate dehydrogenase; lyso-PC, lyso-phosphatidylcholine; PtdCho, phosphatidylcholine. and H2O2 causes about half as much damage as infection with wild-type strains. Recent evidence in support of the coexistence of two apoptotic processes during pneumococcal infection comes from studies on dendritic cells (9), which demonstrate bacterial toxin–induced, caspase-independent apoptosis and host response–derived, caspase-dependent apoptosis. Such a multiplicity of apoptotic triggers complicates efforts to deploy apoptosis inhibitors to improve neuronal survival after meningitis, a setting where a single or at least dominant salvage treatment would be highly desirable. 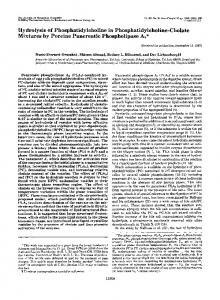 Phosphatidylcholine (PtdCho) is a major component of eukaryotic cell membranes. Its biosynthesis occurs mainly via the cytidine diphosphocholine (CDP-choline) pathway and involves three enzymatic reactions (Fig. 1; references 10 and 11). The rate-limiting step in this pathway is the second step, the CTP:phosphocholine cytidylyltransferase (CCT)-catalyzed reaction, and the activity of this enzyme is highly regulated (12). Induction of apoptosis by inhibition of the enzymes CCT or choline phosphotransferase (CPT) is a mechanism of action of the anticancer drugs ET-18-OCH3 (13), HexPC (14), camptothecin and etoposide (15), the cytotoxic agents farnesol and chelerythrine (15), and the short-chain ceramides (16, 17). Choline deprivation, leading to PtdCho deficiency, is also known to trigger apoptosis in neurons (18). Here we report that the apoptosis of neurons and microglia triggered during pneumococcal infection appears to involve the inhibition of PtdCho biosynthesis as a determining factor, the first example of this type of toxicity induced by a bacterium. Figure 1. The Kennedy pathway. The CDP-choline pathway is catalyzed by choline kinase (CK), CTP:phosphocholine cytidylyltransferase (CCT), and CDP-choline:1,2-diacylglycerol cholinephosphotransferase (CPT; reference 10). 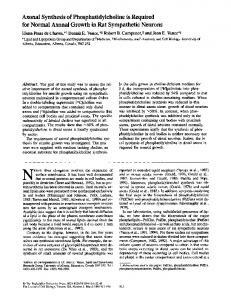 alone showed no hippocampal apoptosis and citicoline did not affect bacterial growth. Mice were killed at 24 h and perfused transcardially with 3% paraformaldehyde and 0.1% glutaraldehyde (Sigma-Aldrich) in 0.1 M cacodylate buffer (Ted Pella, Inc.), pH 7.4, adjusted with sucrose to 300 mOsm. Brains were removed, postfixed overnight in 10% formalin, embedded in paraffin, sectioned (5 m), deparaffinized, rehydrated, and stained. Hematoxylin and eosin stain was used to visualize and measure the area of dentate gyrus of the hippocampus using the NIH Scion Image Beta 4.02 software. To quantitate apoptosis, TUNEL staining (five sections per mouse) was performed (Apop Tag Plus Peroxidase In Situ Apoptosis Detection Kit; Serologicals Corp.). All experiments were performed in compliance with National Institutes of Health (NIH) and institutional guidelines. Statistical Analysis. Statistical analysis was performed using SigmaStat software version 2.03. Data are presented as mean SD or SEM as indicated in the figure legends. Differences between groups were evaluated using the Student’s t test or the Mann-Whitney rank sum test unless otherwise stated. P 0.05 was considered an indication of statistical significance. Figure 2. Inhibition of PtdCho biosynthesis by S. pneumoniae induces apoptosis. (A) FACS® analysis of mitochondrial membrane potential of control (left) and infected (middle and right) microglia. Dot plots show side scatter signals (x axis) versus fluorescence intensity (y axis) for microglia cells. Shift of fluorescence of JC-1 from 590 (FL2) to 530 nm (FL1) indicates membrane depolarization. Analysis representative of six independent experiments. (B) Rate of PtdCho biosynthesis. [methyl-3H]choline–labeled human primary microglia (black bars) or cultured cells (white bars) were infected with 2  107 cells of strain D39 or R6 pneumococci for 4 h. PtdCho synthesis was measured by scintillation counting and values were normalized to the protein concentration of the sample. Values are mean SE of 10 duplicate experiments. *, P 0.05. (C) Distribution of [methyl-3H]choline incorporation into water-soluble choline intermediates in microglia. *, P 0.05. Total cpm incorporated were 292,536 68,812. Bacteria alone incorporated 13,410 4,797 (4.5%). Figure 3. Rescue of microglia from apoptosis by lyso-PC. (A) LDH release and trypan blue uptake of microglia incubated with different concentrations of lyso-PC. Microglia were exposed to different concentrations of lyso-PC for 4 h or to 0.5% Triton X-100 for 30 min and release of LDH (white bars; reference 49) and uptake of trypan blue (gray bars) were measured. Values are mean SEM of 12 experiments (LDH assay) and 6 experiments (trypan blue assay), and the mean of the cells treated with 80 M lyso-PC was compared with the cells treated with 120 and 160 M lyso-PC, or 0.5% Triton X-100, respectively. * and #, P 0.05. (B) 5  105–106 microglia were exposed to 80 M lyso-PC 1 h before infection with strain D39 or R6 for 4 h. Cells were considered viable according to their scatter characteristics and their lack of annexin V and/or annexin V/propidium iodide staining. Values are mean SE of six duplicate experiments counting 10,000 events. *, P 0.05 with versus without treatment. Inset: Morphology by light microscopy (magnification, 400). (C) Immunoblot of AIF in mitochondrial and cytosolic cell fractions. Microglia were either uninfected (lane 1) or infected with R6 pretreatment with 80 M Lyso-PC (lanes 2 and 3) or 5 M BAPTA (lane 4). Figure 4. Effect of loss of function mutations in S. pneumoniae on ability to induce apoptosis and inhibit PtdCho synthesis. Microglia were exposed for 4 h to 107 CFU/ml of each bacterial mutant indicated or to 1 g purified pneumolysin or 1 mM hydrogen peroxide. [methyl-3H]choline incorporation was quantitated by scintillation counting. Values are mean SE of six experiments and were compared with mean of control, untreated cells (50,764 cpm/mg protein 100%). Apoptosis was determined as described in Fig 2 A. *, P 0.05. Figure 5. Effect of inhibition of apoptotic pathways on PtdCho synthesis inhibition by S. pneumoniae. Microglia were treated with the indicated inhibitor and then exposed to bacteria for 4 h. [methyl-3H]choline incorporation was quantified by scintillation counting and apoptosis was determined by annexin V labeling. Values were compared with control, untreated cells (29,221 dpm/mg protein 100%). ZVAD, Z-Val_Ala_Asp(Ome)-Fmk; ALLN, N-acetyl-Leu-Leu-NLE-CHO; BAPTA, Ca2- chelator. *, P 0.05 comparing inhibition of labeling in infected cells plus inhibitor to control cells plus inhibitor. There is no significant difference between values shown and infected cells without inhibitor. Figure 6. Protection from pneumococcal-induced apoptosis in the hippocampus in vivo. Three groups of six mice were injected via lumbar puncture with saline or pneumococci as indicated. One group also received citicoline intraperitoneally 24 h before infection and via lumbar puncture at the time of infection. Mean bacterial number in cerebrospinal fluid for infected animals was 107 bacteria/ml for pneumococci alone and 3  107 bacterial/ml for pneumococci with citicoline. Histopathology of the dentate gyrus: (A) normal control, (B) infected with pneumococcus, and (C) infected with pneumococcus and treated with citicoline. (D) Number of apoptotic neurons per mm2 in the hippocampus ascertained at 24 h of infection. The data were statistically analyzed by a One Way Analysis of Variance (P 0.05) followed by a Student-Newman-Keuls test. #, the difference between controls and meningitis (P 0.01). *, the difference between untreated meningitis and citicoline treatment (P 0.02). dine) and choline levels in rodent and human tissues (36, 37), rescues CA1 hippocampal neurons from ischemic death (38), and increases PtdCho formation in neuronal tissues in vitro and in vivo (39). Our in vitro results suggested that application of excess CDP-choline might also rescue PtdCho production in cells dying during pneumococcal meningitis by overcoming the partial inhibition of CPT. Treatment of microglia or primary neurons with 100 M citicoline (CDP-choline) 24 h before exposure to strain R6 rescued the cells from apoptosis. Although media alone or with citicoline caused little cell death ( 10%), microglia exposed to R6 for 2 h showed 52 15% apoptosis and this value was reduced to 16 3% in the presence of citicoline (n 4; P 0.05). Similarly for primary neurons, exposure to R6 for 3 h caused 40 12% apoptosis and this value was reduced to 28 16% in the presence of citicoline (control baseline 22 7% apoptosis; n 4–8; P 0.05). Citicoline prevention of pneumococcal-induced apoptosis was extended to the in vivo setting using a mouse model of meningitis (21). Animals were treated with citicoline and 24 h later, they were treated again and challenged with strain D39 pneumococci. 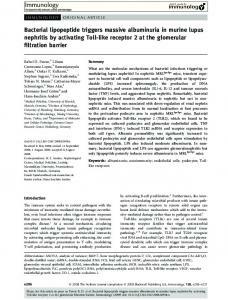 The amount of apoptosis in the hippocampus was quantitated 24 h after infection. Animals receiving citicoline had a dramatic reduction in neuronal cell death (Fig. 6) as compared with untreated, infected controls (P 0.05). The damage was reduced to levels found in uninfected controls. This degree of protection has not been achieved by other apoptosis inhibitors directed at either the caspase-dependent (6) or -independent pathways of pneumococcal-induced apoptosis (7). To determine if apoptosis could be prevented after the onset of infection, as would be applicable to the clinical situation, mice were challenged with bacteria and then treated with citicoline 6 h later. Brain histopathology was examined at 24 h. Although all infected mice harbored 3–9  107 bacteria/ml cerebrospinal fluid, cells in the hippocampus of mice receiving citicoline were protected against apoptosis to levels approximating uninfected controls (apoptotic cells/mm2 dentate gyrus: saline controls: 37 18; infected: 71 29; infected plus citicoline: 39 8; P 0.04). that may explain, in part, the very high sensitivity of this region of the brain to injury during meningitis. Treatment with excess of the pathway intermediate CDP-choline (citicoline) has shown beneficial effects in a number of central nervous system injury models and pathological conditions of the brain (35, 38, 39), although the results of human clinical trials in stroke remain mixed (34). Our data show that neuronal apoptosis after experimental S. pneumoniae meningitis is amenable to medical intervention using CDP-choline and/ or its metabolic derivatives. This effect was seen even when citicoline was administered after the animals were symptomatic. The strength of the protective effect is significantly greater than that seen with apoptosis inhibitors and argues for further study of citicoline to define its clinical potential in meningitis. It is likely that the mechanism of the beneficial effect of CDP-choline is to increase the supply of pathway intermediates and thereby overcome the bacterial-induced partial inhibition of CPT, the final, nonrate limiting enzyme in the pathway. However, in theory, the effect might also be due to reduced phospholipid destruction through inhibition of phospholipase activation (47) or arachidonic acid release (39). It is also possible that clinical benefit might be aided by replenishing acetylcholine in neurons, although this pool is very small compared with membrane PtdCho (48). Pneumococci are known to induce caspase- and AIFdependent apoptosis. Yet the process studied here was not reversible with inhibitors of known apoptotic mediators, but rather complete rescue from apoptosis was achieved by the addition of lyso-PC or CDP-choline. These findings would be consistent with a final common pathway of damage at the membrane level regardless of the original stimulus and thus, a dominant salvage effect of agents preserving phospholipid integration into membranes. The field of meningitis research has long sought an agent capable of protecting neurons from damage during antibiotic treatment of disease. This goal appeared to become less realistic with the discovery of the multiple apoptotic pathways triggered by pneumococci in neurons. The strong response to lyso-PC or CDP-choline justifies optimism that despite a diversity of proapoptotic signals during infection, significant neuronal rescue might be achieved by a single therapeutic intervention for meningitis in vivo. We are grateful to G. Gao and J. Wang for assisting in Western blot analyses and in the radiolabeling assays. We thank Dr. M. Bastholm Bille for performing experiments with inhibition of calpains and D. Freyer for culturing primary neurons. This work was supported by NIH (grant AI27913 to E.I. Tuomanen and grant GM45737 to S. Jackowski), the Cancer Center CORE grant CA21765, and the American Lebanese and Syrian Associated Charities. 1. Schuchat, A., K. Robinson, J.D. Wenger, L.H. Harrison, M. Farley, A.L. Reingold, L. Lefkowitz, and B.A. Perkins. 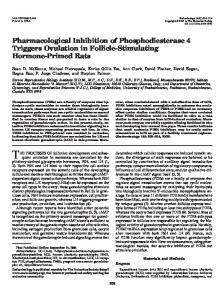 1997.
of CTP:phosphocholine cytidylyltransferase. J. Biol. Chem. 275:9699–9708. Adibhatla, R.M., and J.F. Hatcher. 2002. Citicoline mechanisms and clinical efficacy in cerebral ischemia. J. Neurosci. Res. 70:133–139. Clark, W., L. Gunion-Rinker, N. Lessov, and K. Hazel. 1998. Citicoline treatment for experimental intracerebral hemorrhage in mice. Stroke. 29:2136–2140. Lopez-Coviella, I., J. Agut, V. Savci, J.A. Ortiz, and R.J. Wurtman. 1995. Evidence that 5 -cytidinediphosphocholine can affect brain phospholipid composition by increasing choline and cytidine plasma levels. J. Neurochem. 65:889–894. Wurtman, R.J., M. Regan, I. Ulus, and L. Yu. 2000. Effect of oral CDP-choline on plasma choline and uridine levels in humans. Biochem. Pharmacol. 60:989–992. Grieb, P., R. Gadamski, R. Wojda, and M. Janisz. 2001. CDP-choline, but not cytidine, protects hippocampal CA1 neurones in the gerbil following transient forebrain ischemia. Folia Neuropathol. 39:141–145. Rao, A.M., J.F. Hatcher, and R.J. Dempsey. 2000. Lipid alterations in transient forebrain ischemia: possible new mechanisms of CDP-choline neuroprotection. J. Neurochem. 75: 2528–2535. Cui, Z., M. Houweling, M.H. Chen, M. Record, H. Chap, D.E. Vance, and F. Terce. 1996. A genetic defect in phosphatidylcholine biosynthesis triggers apoptosis in chinese hamster ovary cells. J. Biol. Chem. 271:14668–14671. Blusztajn, J.K., M. Liscovitch, and U.I. Richardson. 1987. Synthesis of acetylcholine from choline derived from phosphatidylcholine in a human neuronal cell line. Proc. Natl. Acad. Sci. USA. 84:5474–5477. Sohlenkamp, C., I.M. Lopez-Lara, and O. Geiger. 2003. Biosynthesis of phosphatidylcholine in bacteria. Prog. Lipid Res. 42:115–162. Badger, E. 1944. The structural specificity of choline for the growth of type III pneumococcus. J. Biol. Chem. 153:183–191. Weiser, J.N., J.M. Love, and E.R. Moxon. 1989. The molecular mechanism of phase variation of H. influenza lipopolysaccharide. Cell. 59:657–665. Zhang, J.-R., I. Idanpaan-Heikkila, W. Fischer, and E.I. Tuomanen. 1999. Pneumococcal licD2 gene is involved in phosphorylcholine metabolism. Mol. Microbiol. 31:1477–1488. Bonev, B.B., R.J.C. Gilbert, P.W. Andrew, O. Byron, and A. Watts. 2001. Structural analysis of the protein/lipid complexes associated with pore formation by the bacterial toxin pneumolysin. J. Biol. Chem. 276:5714–5719. Arrigoni, E., N. Averet, and F. Cohadon. 1987. 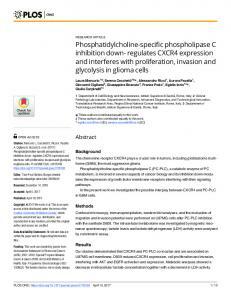 Effects of CDP-choline on phospholipase A2 and cholinephosphotransferase activities following a cyrogenic brain injury in the rabbit. Biochem. Pharmacol. 36:3697–3700. Bussiere, M., J.E. Vance, R.B. Campenot, and D.E. Vance. 2001. Compartmentalization of choline and acetylcholine metabolism in cultured sympathetic neurons. J. Biochem. 130: 561–568. Koh, J.Y., and D.W. Choi. 1987. Quantitative determination of glutamate mediated cortical neuronal injury in cell culture by lactate dehydrogenase efflux assay. J. Neurosci. Methods. 20: 83–90. 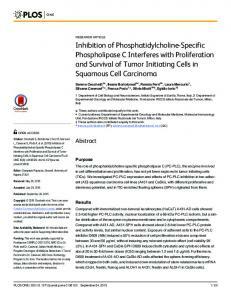 Report "Bacterial Inhibition of Phosphatidylcholine Synthesis Triggers ..."